OOPS! your browser doesn’t support video formats. I suggest you to upgrade your browser. Imagine an island with clear blue skies and azure blue seas. 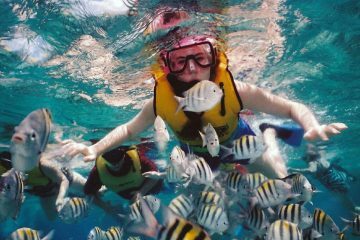 An island with beautiful beaches and enchanting jungles ready to be explored. 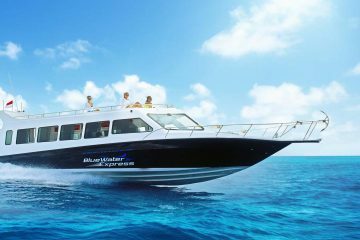 The island you’re imagining is Bali and Bali Tours and More is here to take the hassle out of making your time on the island as enjoyable as possible, as you explore the many things to do in Bali. Browse our full range of activities and book and pay securely online. 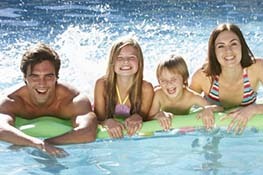 Making the most of your holiday has never been easier; we take your enjoyment seriously. No matter what makes your ideal vacation, you’re sure to find it here. Experience a unique and fascinating traditional culture, practiced by a warm and welcoming population. Five-star accommodation and Michelin starred restaurants or charming traditional homestays and eateries provide enticing options no matter what your budget. 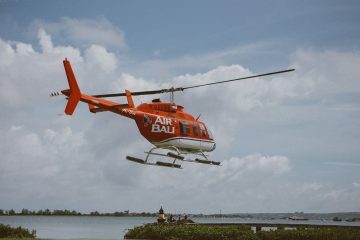 World class surf breaks, cultural tours and experiences lead the way to time at some of the world’s finest beach clubs. 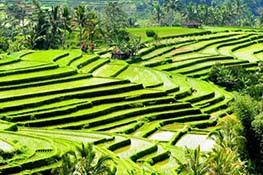 Bali, Island of the Gods is the jewel in the crown of not only Indonesia, but of South East Asia. 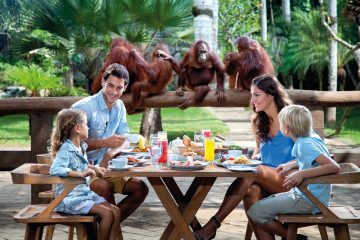 We invite you take advantage of all this unbeatable destination has to offer as you experience your tropical holiday of a lifetime. 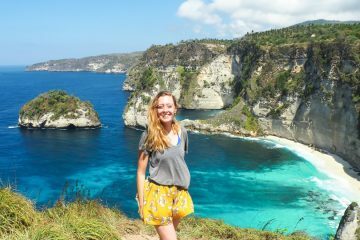 Bali was once part of the hippy trail and overland backpackers were followed by surfers hunting out uncrowded waves in adventurous destinations. 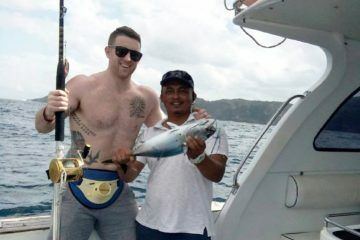 Though the history of tourism in Bali in fact goes back further than this to the first half of the 20th Century, when artists and musicians, such as the American Colin McPhee came to experience the local culture and customs, spending much of the 1930s on the island. 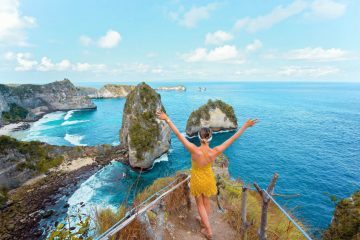 The allure of Bali as a tourist destination has only increased over time, and whether your ideal holiday is action packed, or lying back and sipping on a cocktail. With a history of discovery by surfers, warm waters and regular waves that are ideal for everyone from beginners to world tour pros, it’s no wonder that Bali remains high on the bucket list for surfers from around the globe. 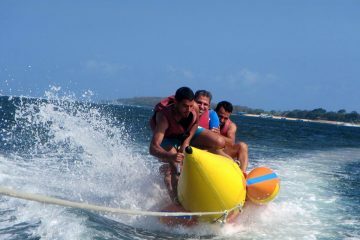 Many people are tempted to hit the waves for the first time once they’re here. 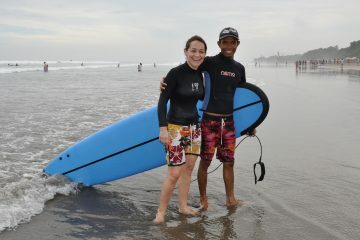 You’ll find surf lessons readily available in South Bali, particularly on the beaches in Kuta, Legian, Seminyak and Canggu. The beach breaks here are much more friendly for learning than the reef breaks around Uluwatu on the Bukit Peninsula which is where you’ll find the more experienced surfers heading to get some time in the green room. If you’re on the island in August, head to Padang Padang and see world class surfers ripping it up at the invitational event the Rip Curl Pro. 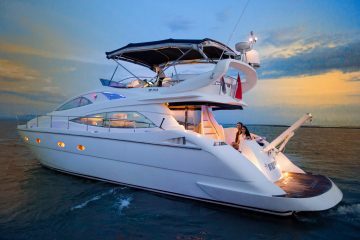 There’s always going to be a really strong temptation to give into to the pull of the sun lounger and spend your days relaxing under the tropical sun, favourite drink in hand, and why not – you’re on holiday and some serious relaxation is in order! 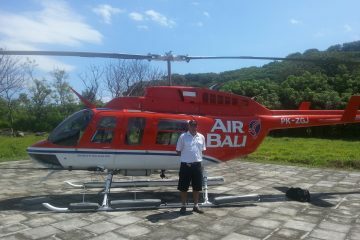 However, take a couple of days to tour Bali and discover the magic of the Island of the Gods. 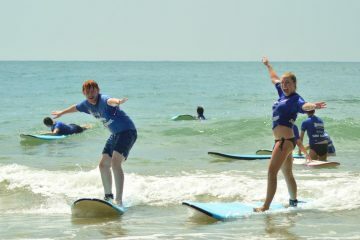 If you want to get into surfing or improve your skills, you’ll find many people offering surf lessons Bali from the beach. 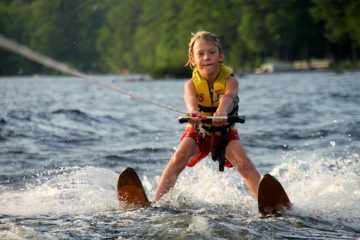 Booking with a reputable operator means that you can be sure of good equipment, high safety standards and expert instruction to get you on your feet and riding the waves in no time. If you’re really looking to improve your skills, then one lesson may not be enough. 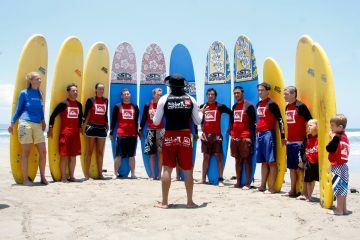 So if you want to fast track your progress, or improve your skills from beginner to intermediate and beyond than a surf camp Bali with daily coaching and trips to the best breaks for the conditions and your ability could be a great way for you to spend your time on Bali. 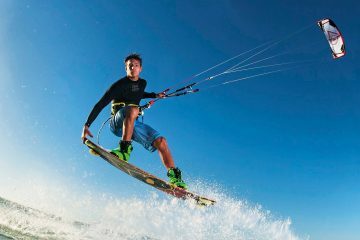 The tropical climate brings warm water and waves as well as wind, and this means that at certain times of the year, Bali is becoming increasingly popular for the relatively new sport of kite surfing. As the winds pick up a little in the afternoon, head to the beaches of Canggu and you’ll find adrenaline seekers being towed through the waves on boards, powered by a kite. 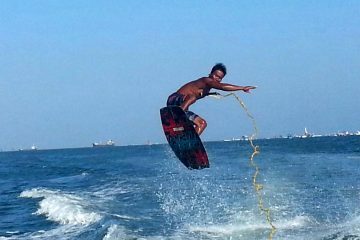 Kitesurfing Bali is one of the latest crazes to hit the island! 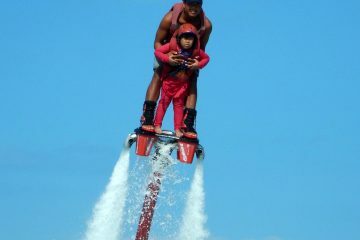 This is only the start of water sports in Bali. 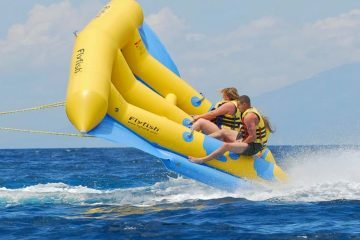 Head over to Nusa Dua or Benoa and you’ll find a whole range of aquatic activities that include parasailing Bali, jet skiing Bali, and banana boat rides. Head below the surface and the possibilities for discovery are endless. 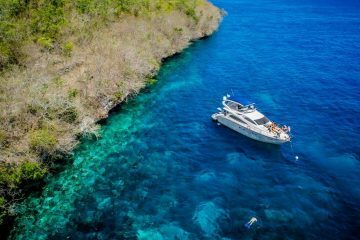 Get a glimpse of what lies beneath with a trip on a glass bottom boat or jump over board for some snorkelling, and see a range of tropical marine life and vibrant coral reefs. 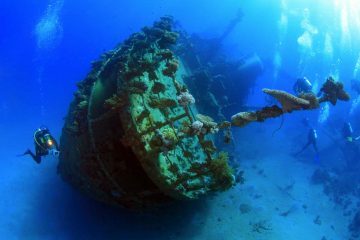 You can even see World War 2 ship wrecks, just a short swim from the beach in Amed. 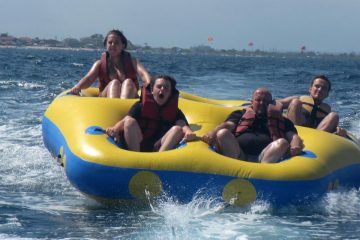 Bali holiday packages mean that you can relieve yourself of the stress and focusing on relaxing and enjoying yourself. 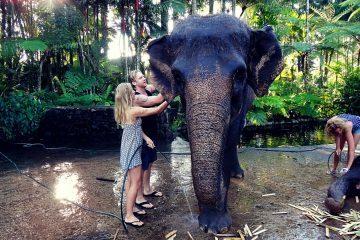 Allow Bali Tours and More, the Bali travel experts to find you the perfect accommodation, be that a hotel or villa, and a range of activities and tours to show you the Island of the Gods at its very best. 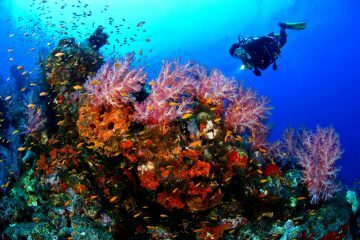 Bali is also a paradise for scuba diving, with a range of dive sites perfect for all abilities from beginners to experienced divers. 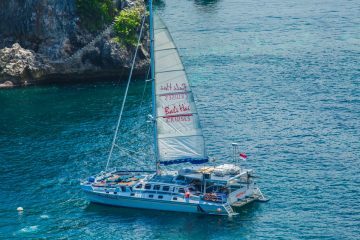 Dive schools with experienced guides and instructors run daily trips for visitors to get underwater – combine your love of the marine world with a visit to Amed or the stunning natural beauty of Pemuteran and the West Bali National Park. 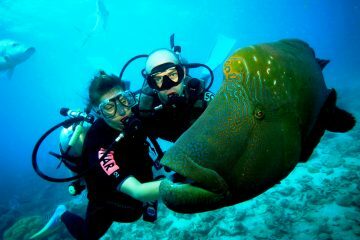 Bali diving schools offer fun dives as well as certified courses with both PADI and SSI. 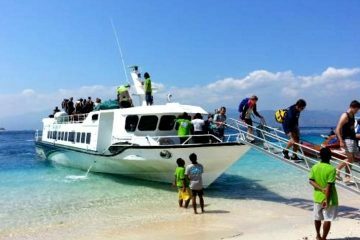 Just a short boat ride from Sanur, the islands of Nusa Lembongan, Nusa Cengingan and Nusa Penida offer a variety of dive sites including Manta Point – so called because this is the place to see manta rays, Crystal Bay, Ceningan Wall, Mangroves and Engine Reef. 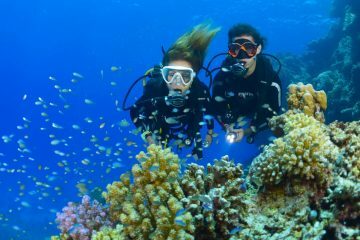 It may be a one-day introductory dive, diving for fun as an experienced diver, or completing qualifications such as your Open Water Diver, or even progressing to instructor level. 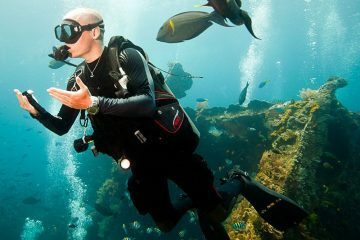 There’s no doubt about it, Bali is a fantastic place to explore underwater and just as good a place to enjoy a beer on the beach afterwards! 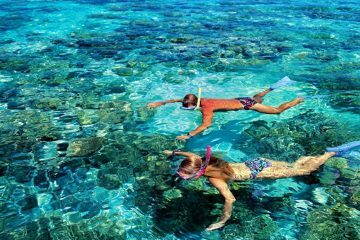 If want to get a glimpse of the magnificent maritime world, but diving isn’t your thing, or you’re short on time, snorkelling Bali is a great alternative. 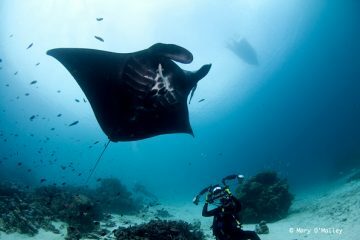 Just hire a mask, googles and fins and with a guide to show you the best spots, you’ll soon be right amongst the action. 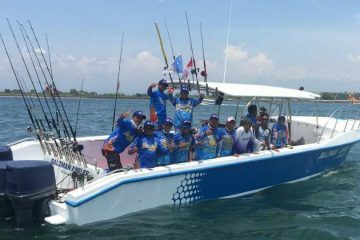 Fishing in Bali is another popular activity with visitors and locals alike. You’ll often see Balinese fishermen heading out to sea in the traditional fishing boats called jukung, or casting their lines from the beach. 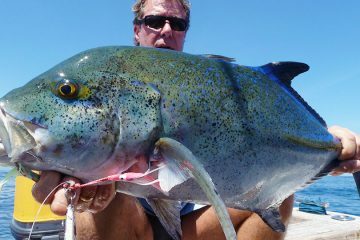 Fishing charters mean that you can head out on a boat for the day, enjoy the sea and you may even bring your dinner home with you. 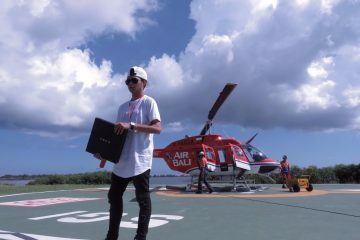 Bali Wake Board Park is a cable wake board course, where beginners and experts alike can speed around the course, and over obstacles, with the convenience of a cable tow, rather than relying on a speed boat to pull you. And if your arms get a little tired, grab a bean bag and order a beer from the bar and watch the rest of your group do their thing at Bali Wake Park! 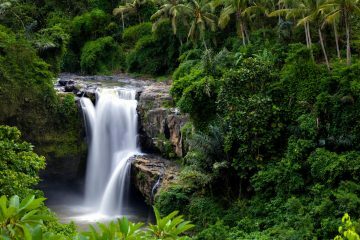 Make sure that you don’t miss out on the top things to do in Bali on your next visit to the Island of the Gods. 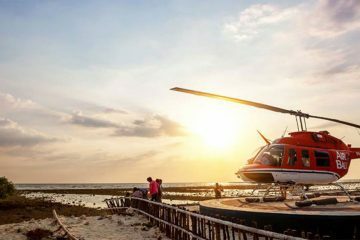 There’s something for everyone, from the thrill of climbing volcanoes to the sophistication of fine dining in Seminyak, Bali is an island of diversity waiting to be explored. 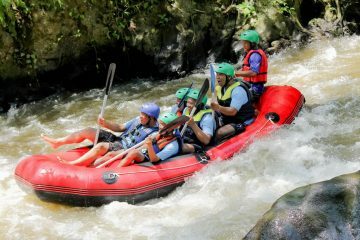 Staying with Bali water sports, but heading inland, white water rafting Bali is an adrenaline pumping fun-filled day out that is also a fantastic way to see some of the natural beauty of Bali. 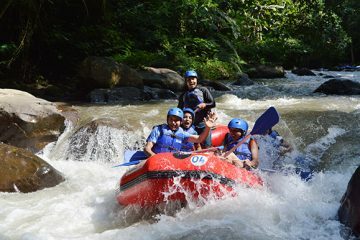 Feel the rush of the rapids as you head down the Ayung River, passing through deep jungle ravines and enjoying vistas of endless rice paddies. 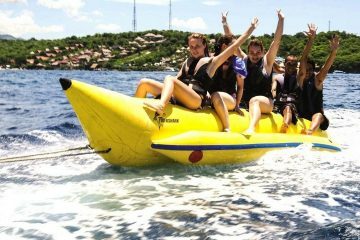 The adventure will include transport from your accommodation – all you need to do is pack your sense of adventure, and of course a change of clothes as you can expect to get wet! 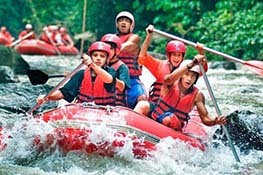 All safety equipment is provided, and you’ll be given a full briefing by the experienced guides before heading out to hit the rapids in your multi-person raft, each guided by a professional raft guide. 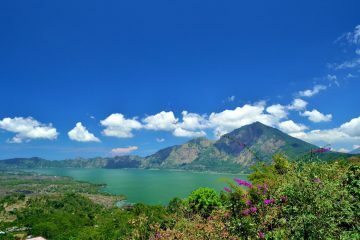 Inland, Bali’s skyline is dominated by majestic volcanoes. 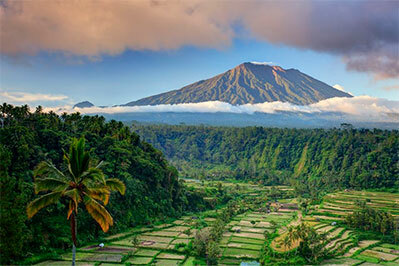 The highest – and for the Balinese most holy of these – is Mount Agung. 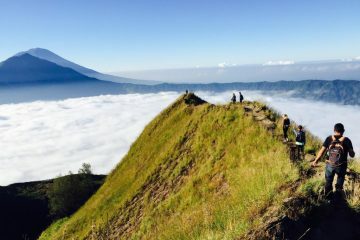 Close by in the Kintinmani area, lies Mount Batur, and Mount Batur trekking is one of most popular activities in Bali for those who like to combine adventure and nature. Mount Batur sits at 1,717 meters above sea level and is still an active volcano. 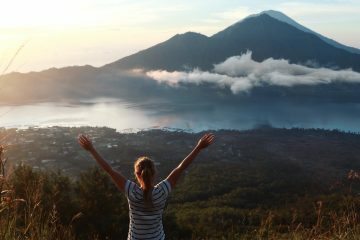 Below Mount Batur lies its stunningly beautiful caldera with huge lake and a number of villages including Kedisan, Songan Trunyan and Toya Bungkah. 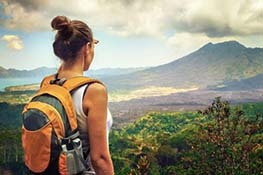 Trekking tours offer visitors to the area the chance to be at one with one of nature’s most powerful forces. Most people choose to make the ascent to be on the summit for sunrise – an experience never to be forgotten. 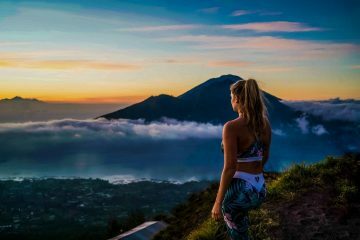 If, however, trekking to the top of a volcano isn’t for you, take a tour and and enjoy a meal from one of the many restaurants in the area where Mount Batur and its caldera will provide a spectacular back drop to your meal. 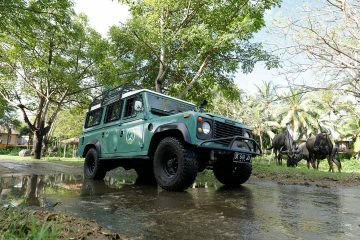 By foot is not the only way to explore off the beaten track in Bali. 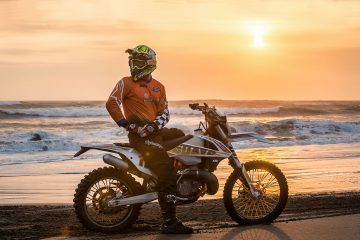 For the petrol heads, a Bali dirt bike tour is a great way of combining adventure and sight seeing. 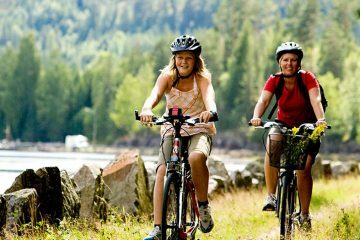 There are numerous possibilities for this although you will need some experience riding a bike before heading out as the tours cover some rough terrain. 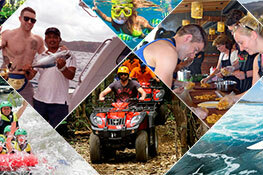 However, guides will tailor the trip to suit your abilities. 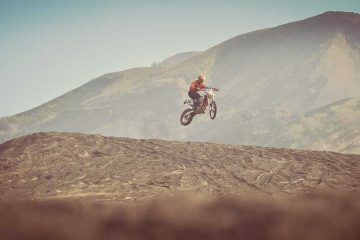 Areas to ride include on the black lava of Mount Batur, through the jungle, or even along the black volcanic sands of beaches near Tabanan. 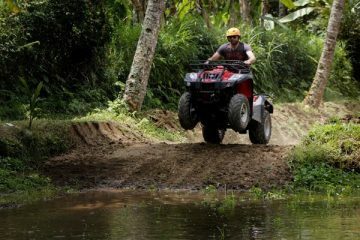 Bikes tend to be 150CC or 250CC, and guides willb ride a motorbike, then the perfect solution is Quad Biking ATV Bali. 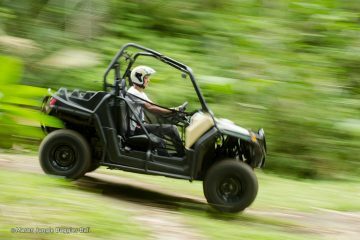 With four wheels on the ground, you don’t need any prior experience for this tour – after a short safety briefing and demonstration and you’ll be ready to ride in no time. 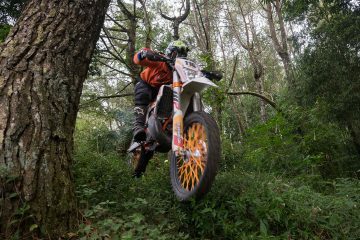 Automatic quad bikes mean no gears to worry about so you’ll soon be riding like an expert. 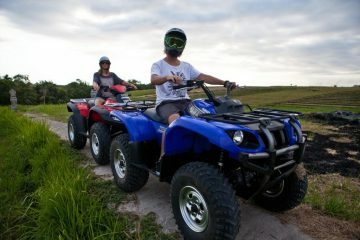 Speeding along deserted beaches, and splashing through fresh water streams you’ll also experience the ethereal world of the rice paddies as you ride down small tracks and see farmers at work tending lovingly to their crops. 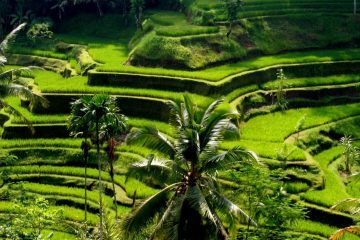 An Ubud tour is high on the list of things do to for many visitors to Bali. Considered the artistic and spiritual capital of Bali, it’s not hard to see why it’s so popular. Perhaps you’ll take a walk through the Monkey Forest Bali, where troops of grey monkeys live in the trees and amongst traditional Balinese sculptures – just remember to hold on to your hats as these cheeky primates are well known to run off with sun hats and glasses, especially if you’re holding some fruit to feed them. Shoppers will love the range of jewellery on offer in charming shops throughout the town, and the numerous artists’ studios and shops are equally as enticing. 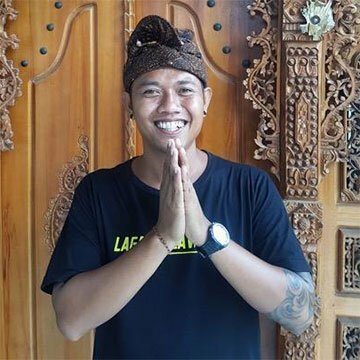 If you want to know more about how the jewellery is made by Bali’s talented artisans, you’ll find a visit to a Silver Factory Bali fascinating. 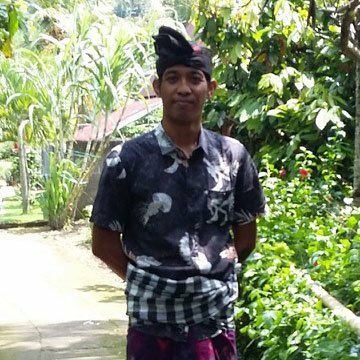 With Bali Tours and More experienced guides and helpful staff, you can be sure that you’ll see the very best Bali places to visit. 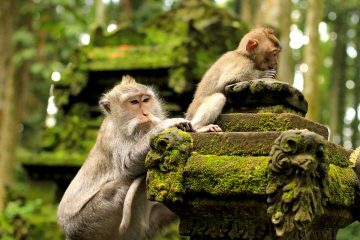 From the Monkey Forest to stunning beaches, and ancient temples to modern shopping malls, the very best of the Bali is waiting for you. 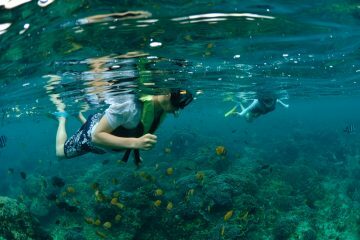 We’re sure that you want to see the best places to visit in Bali. 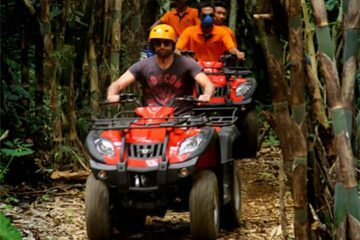 That’s why at Bali Tours and More we’ve put together a range of tours that allow you to combine adventure with discovery and sightseeing with cultural experiences. 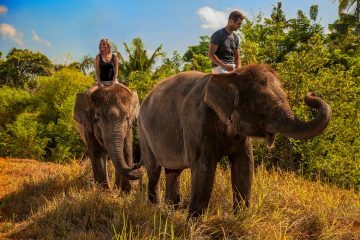 We’ve searched the island and put together a wide range of tour itineraries, so your perfect island holiday experience is just a click away. 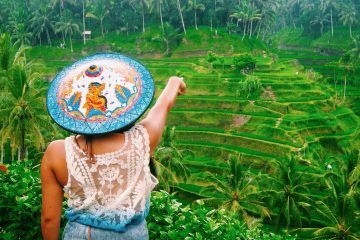 Ubud is also known worldwide as a destination for yoga enthusiasts, so if you’re looking for a yoga retreat, or a yoga class, this is the place to be! Numerous yoga studios specialising in different schools of yoga offer daily classes, led by top quality yoga instructors, both local and international. 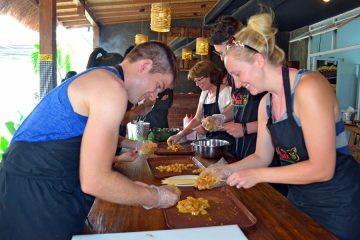 A yoga retreat Bali is ideal for either new or experienced yogis, wanting to spend time fully immersed in and developing their practice. 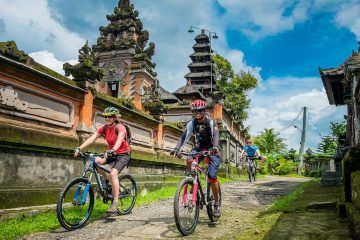 Ubud and Kintamani are ideal places to enjoy a Bali cycling tour. 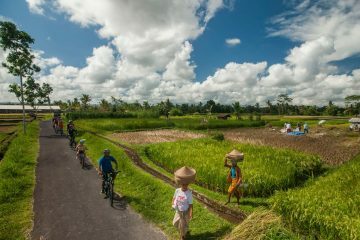 Cycle through the calm of the rice paddies and visit traditional villages and Balinese homes, learning about the layout of each family compound which all share the same basic design. Cycling from Kintamani, after enjoying a breakfast overlooking the majestic Mount Batur, it’s down hill all the way! 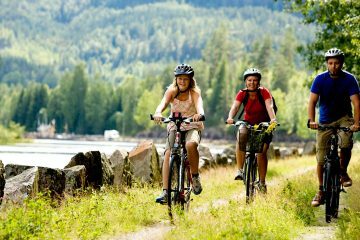 Along quiet country roads, and small trails you’ll be at one with nature and the local people. Your cycling tour may include a stop at a coffee plantation Bali where you can learn how this highly prized crop is farmed and turned into your delicious tasting latte. Of course, a cycling tour isn’t the only way to visit a plantation and you may wish to combine a visit with any number of other tours. With cocoa beans being one the crops grown on Bali, there’s something for people with a sweet tooth, and artisan chocolate factories thrive on the island, turning the beans into unique combinations and flavours of some of the best chocolate in the world. 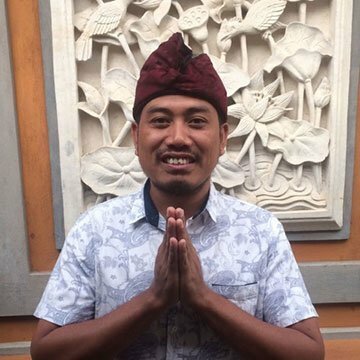 Chocolate factories in Bali are a craft industry – farmers tend their crops and often follow the process through to production, so they know the importance of and take pride in taking care of the environment. 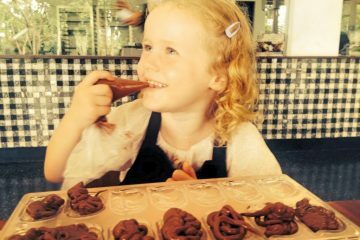 On your visit to a Bali chocolate factory, you’ll also be able to follow the chocolate’s journey from cocoa bean to delicious mouth watering-treats that you just won’t be able to resist. 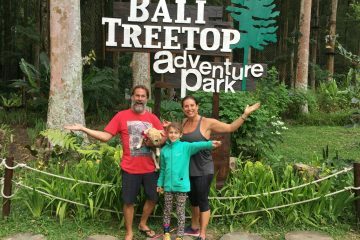 While in the Bedugul area, Bali Tree Top Adventure Park, set in the Bali Botanical Gardens is sure to be hit with all the family. Feel the adrenaline pump, and try to keep your legs steady as you tackle one of the seven obstacle courses set high in the trees. 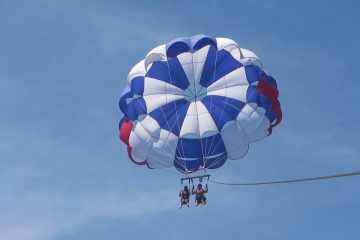 There are different circuits designed for different ages, or different levels of thrill seekers. 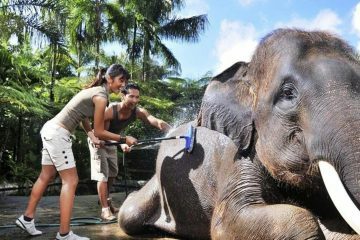 For animal lovers, there isn’t a better place than Bali. Bali dogs are unique breed and seen all over the island – you can be sure one will tug on your heart strings. 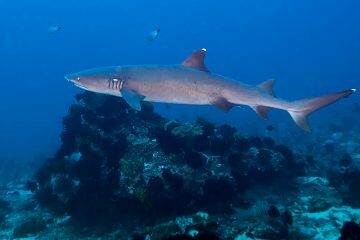 And of course there’s the rich and diverse marine wildlife which includes a huge variety of fish, as well as dolphins and giant turtles. 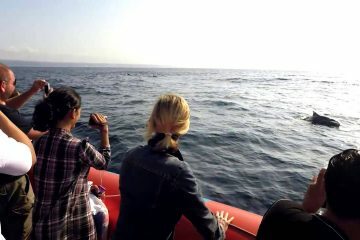 You can see dolphins in the wild on a Bali dolphin tour in the north of the island near Lovina. 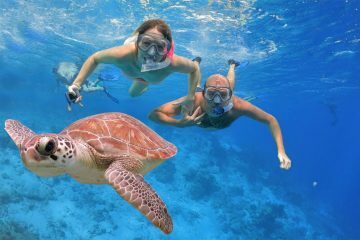 There are many turtle conservation programmes where visitors can be involved in releasing hatched turtles back in to the wild, including at Turtle Island Bali and on Kuta beach. 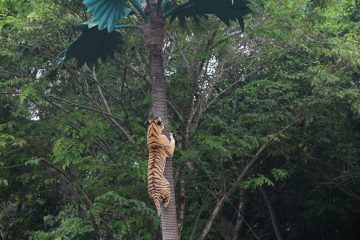 Bali Zoo is an award winning destination, with a strong focus on conservation. 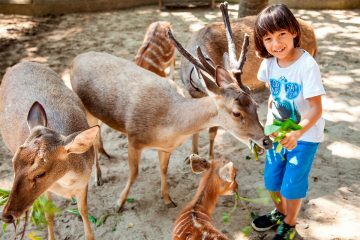 Animals at the zoo include African lions, salt water crocodiles, a variety of primates, birds, dear, tiger, and Sumatran Elephants. 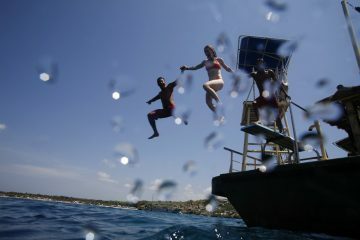 Your Bali travel experience allows you to see beyond the shores of the island. 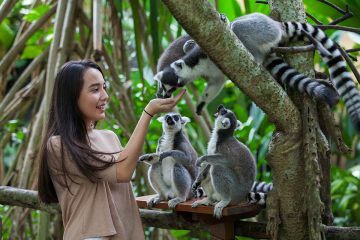 The Bali Safari and Marine Park offers you the chance to you to see animals from seven continents right here on the Island of the Gods. The park offers a variety of different tour packages to see different areas and animal habitats. 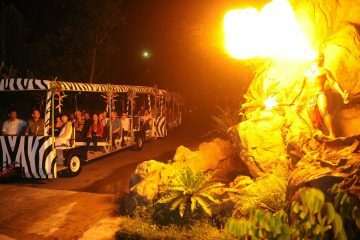 The night safari is a particularly special experience, and it’s even possible to stay at the park in the Safari Lodge, as there’s certainly enough to keep you entertained for more than one day here. 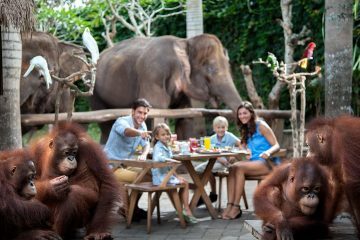 The Safari Park is also heavily committed to conservation, notably for species such as the Bali Mynah (the Bali Starling), the Sumatran Elephant and the Sumatran Tiger. Guides at the park are knowledgeable and always more than happy to answer your questions about what you see. 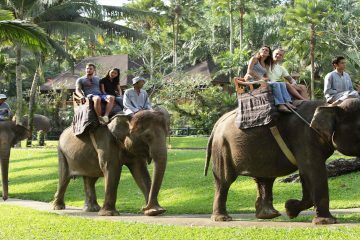 The Mason Bali Elephant Safari Park Bali, established in 1997 is an award winning facility that’s dedicated to rescuing elephants and is currently home to 31 endangered Sumatran elephants (four were actually born in the park). 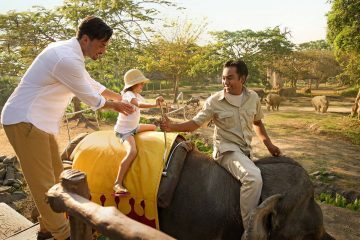 Having developed a global reputation for the way in which the park cares for elephants, visitors are able to learn more about these giant animals whilst interacting with them in a comfortable and safe environment. Recognition for their work includes being a World Wildlife Foundation Partner in Conservation. 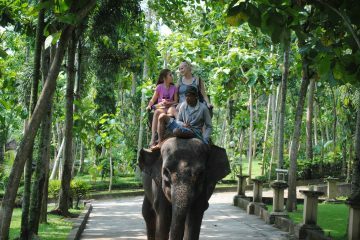 You can also enjoy an Elephant ride at the Elephant Safari Park Bali. 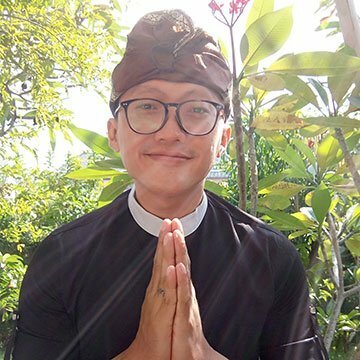 It’s hard to go more than a few meters on Bali island without passing a temple – you’ll see them in the gardens of most family homes, and even shops and warungs will have a small ‘temple’ somewhere – often an ornately adorned shelf. There are also much larger temples, which have become tourist attractions as well as remaining active places of worship, often because of their stunning locations. Uluwatu Temple sits high on the cliffs overlooking the Indian Ocean. It is one of six ‘sea’ temples around the island which the Balinese believe protects the island from evil spirits which may try to enter the island from the sea. 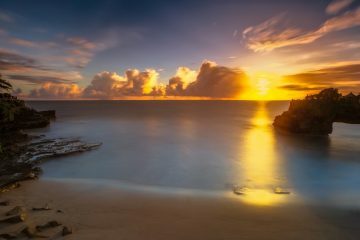 With it’s simply stunning location 70 meters above sea level on the cliff tops, Uluwatu Temple is justifiably one of the most popular places on the island to watch sunset. 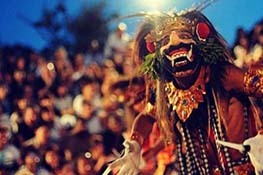 For an even more mesmerizing experience, combine your visit here with a sunset performance of the Kecak Dance. This trance dance was developed in the 1930s in Gianyar, probably at least in part with the influence of the German painter and musician Walter Spies. Usually performed only by men, no musical instruments are used in the performance – the accompaniment instead coming from the singing and body percussion of the dancers themselves. These percussive sounds, combined with the costumes and drama of the dance, and the use of fire all come together at this unbeatable cliff top venue as the sun sets for an experience you’ll never forget. 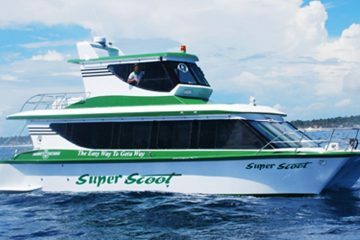 This is one of the many Bali attractions guaranteed to make your stay on the island unforgettable! Tanah Lot Temple is another of the pillar temples, with the function of protecting the island from evil spirits coming on to land from the sea. 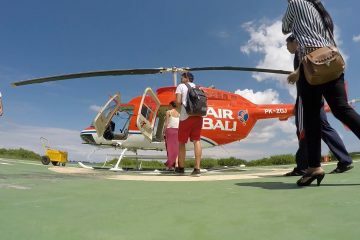 It’s perhaps even more popular than Uluwatu temple for sunset, and no Bali trip would be complete without a visit here. There’s an interesting market area as you enter, and the low cliffs have a number of restaurants to choose from – a great place to sit with a drink over sunset. The temple itself is actually set on a small island, cut off from he mainland at high tide. Visit at low tide, and you may be able to see the holy snake, kept in a small cave on the beach. Pura Besakih, also known as the mother temple, site on the slopes of Mount Agung – Bali’s most sacred volcano and is the largest and most sacred temple for Bali’s Hindus. Close to Ubud lies the Tirta Empul water temple Bali in the village of Manukaya. Founded in 926 A.D. the temple is dedicated to the Vishnu, the Hindu God of Water. At the heart of the complex is the Jaba Tengah which consists of two purification pools. 30 water spouts poor into the pools, believed to have cleansing and healing properties. As well as the water temples, you may enjoy a visit to a water palace Bali. 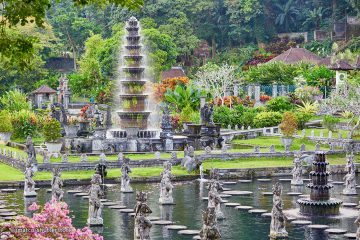 Tirta Gangga and Ujung Water Palaces both found in Karangasem Regency. Taman Ujung was built by the late Raja of Karangasem. Carefully manicured gardens surround a main central lake with bridges connecting to the main building at the centre. Steep steps lead through more gardens and buildings towards the rear of the property, giving stunning views of the palace. 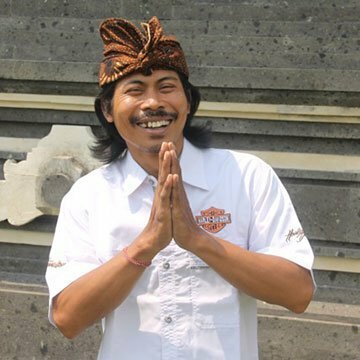 Tirta Gangga was also built by the last Raja of Karangasem – in this case literally as it is said that he labored with his subjects to build the palace. Three separate complexes, each with their own ponds form the palace. Perhaps the most famous pond in this water palace is the one found just as you enter the main gate, where a series of stepping stones invite you to walk across the pond, watching the large colourful fish as you do. 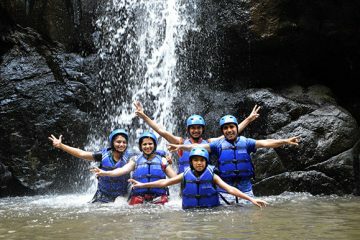 Staying with the theme of water, Bali waterfalls are another popular tourist attraction. 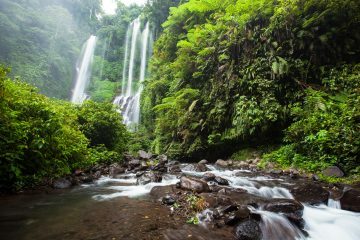 Easily accessible by road, Gitgit waterfall near Singaraja is popular with visitors. 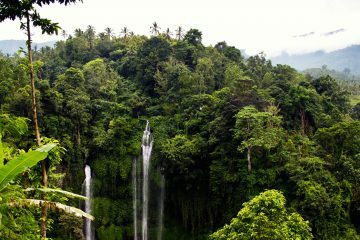 Sekumpul Waterfall, also near Singaraja is considered by many to be the most beautiful waterfall in Bali. It’s more of a trek to get to then Gitgit, which means it’s a little quieter in terms of visitors, but this one is definitely worth the effort. 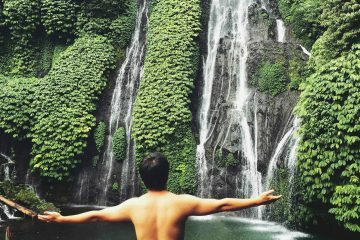 And if you’re staying in Ubud, Tegrnungan Waterfall can actually be found not out in the wilderness but in the town itself. 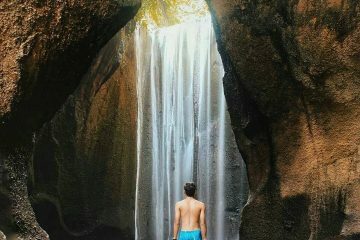 The beauty of the waterfall, convenient location and natural springs for bathing in mean a visit here is a winner every time. 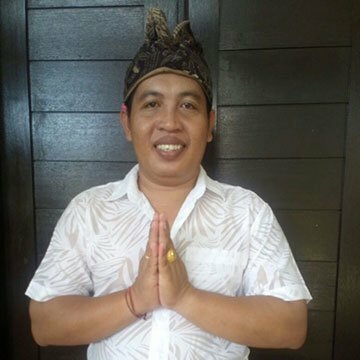 Why not hire a Bali driver for the day, and decide on your own bespoke tour? 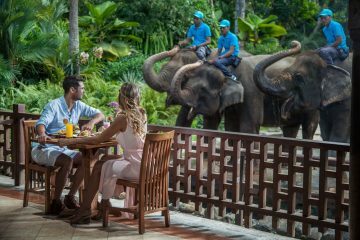 It can be hard to decide where to go in Bali; with so much on offer and a limited amount of time available on your holiday, you want to make sure you see the best the island has to offer. You may want to head to Ubud, or you may want to relax by your pool in a five-star resort. Exploring the culture and history of the island may be your thing. 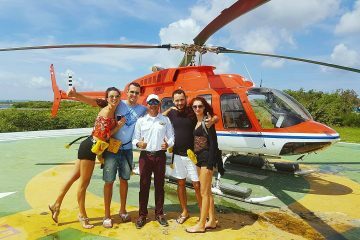 Whatever you want to do or where ever you want to go in Bali you can be sure of making life long memories from your time in paradise. While it may not be the first thing that comes to your mind when you think about a tropical island, but there are a number of fantastic Bali golf courses, all welcoming non members to play and at surprisingly affordable rates. 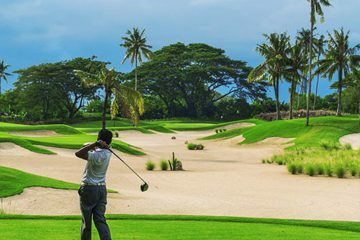 Bali National Golf Course in Nusa Dua is a Par 72 course, set in the resort area of Nusa Dua, and so is easily accessible for those staying in the main tourist areas in the south of Bali. On the Bukit Peninsula the New Kuta Golf Course offers gold with stunning sea views whilst the Handara Golf Resort, Bedugul offers an unbeatable inland setting. To experience some more of the cultural and artistic heritage of both Bali and Indonesia, the Devdan Show Bali mixes traditions from across the archipelago nation with acrobatics, dancing, drama, exotic costumes, and special effects. Showing four times a week in a modern, air conditioned theatre, this really is one for all the family. 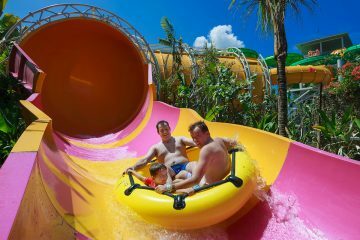 Another activity that’s sure to be a hit for young and old alike is a trip to Waterbom Park Bali, voted Asia’s best waterpark! 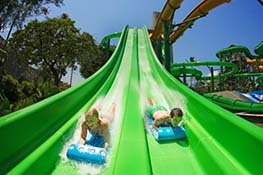 Whether it’s the lazy river or the thrill of the vertical drop slides, it’s a great day out for everyone. 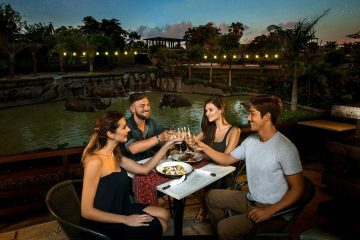 After a day at the waterpark, you’ll going to want a good feed, so why not head down for some Jimbaran seafood on the beach? Watch the sunset as you sit at a table on the golden sands of Jimbaran beach and select from a range of fresh fish to be grilled to perfection and served with rice and Balinese sambal. 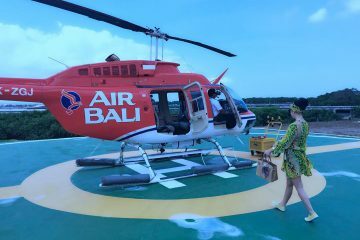 Taking the adventure up a level, helicopter Bali tours are an unmatchable experience, as you soar into the skies and see Bali laying out beneath you. 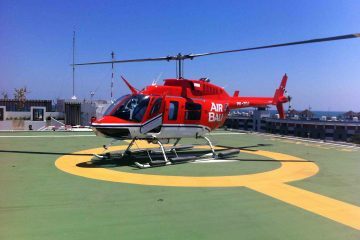 It’s also a great way to beat the traffic, and what a way to make an entrance at your hotel or that special party! 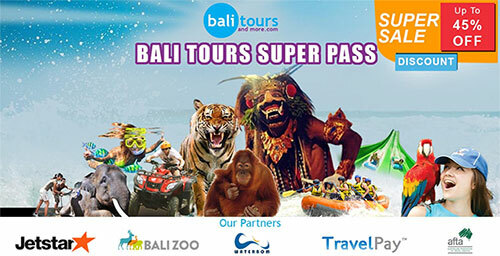 There are Bali tourist attractions around every corner. 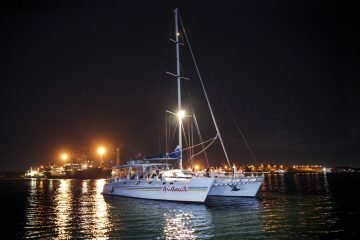 From the beaches to the mountains, from temples to shopping malls and fine dining restaurants to delicious street food. 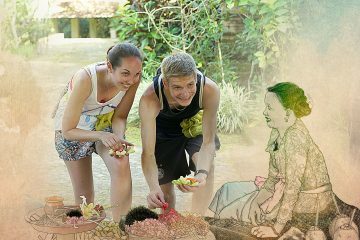 In Bali the ordinary becomes the extraordinary, every day a combination of experiences that lead to the holiday of a lifetime. 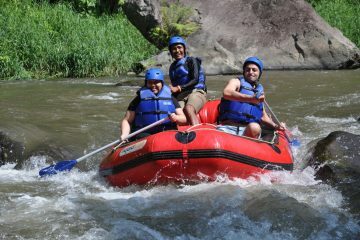 There really is so much more to Bali than than great hotels, restaurants, villas and the beach. There’s a whole world waiting to be explored. 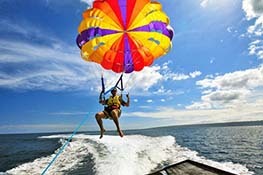 Let us help you to do more, see more and discover more on your Bali holiday. 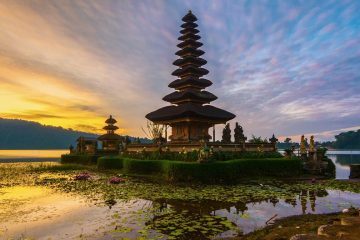 If you’re only the island for a few days and want to make the most of the magical Island of the Gods, then a Bali Indonesia package tour is the perfect answer. 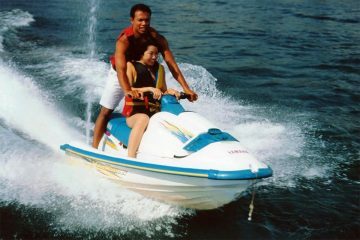 You can trust that you’ll be seen the very best that the island has to offer for a trip never to forget. 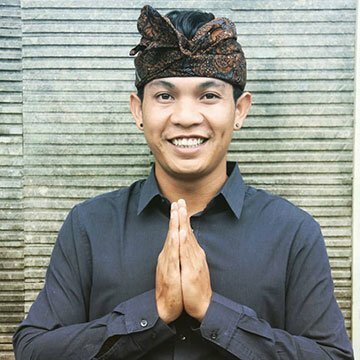 A Bali travel guide will make sure that you don’t miss out on the very reason that you go on holiday – to experience a new culture, see new sights and stunning scenery, eat great food and enjoy comfortable accommodation as well, of course, as to relax and take things east for a while. 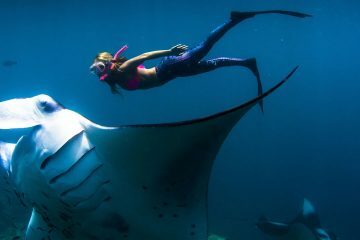 Bali is the perfect place for all of these things. 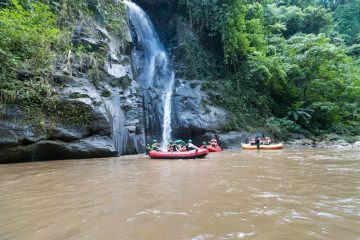 Come Join Us On Bali’s Best Adventure Tours. 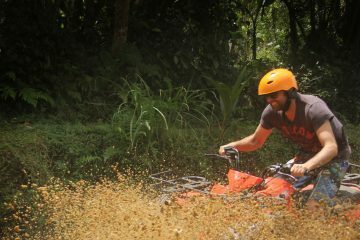 Tours Designed To Get The Adrenalin Pumping! 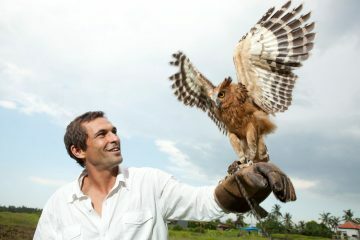 Bali Bird Park Bali Bird Park has been a leader of Bali’s eco tourism scene for more than two decades. 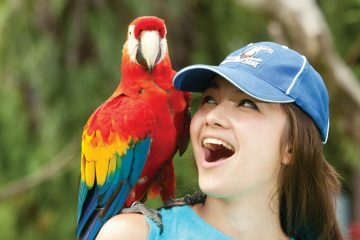 Discover the innate beauty of Bali, whilst challenging yourself with an adrenaline pumping activity at Bali Tree Top Adventure Park. 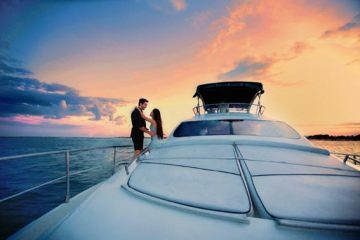 Bali is a pretty romantic place - there's something in the air that brings out that loving feeling in everyone. 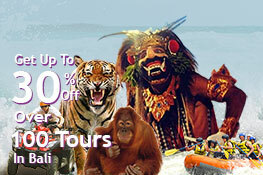 Bali Tours And More has the best range of things to do in Bali. Select from over 100 tours. 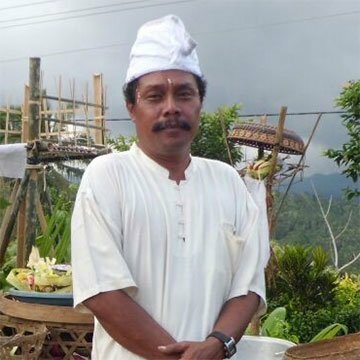 We offer the best pricing for tours in Bali. Book online and save. The Island of the Gods is a wondrous place to explore. Book the best tours here. Book safe and secure with online booking platform. A name you can trust. Not sure where to go? 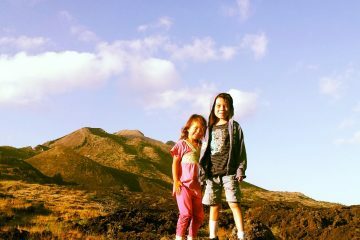 Chat with the locals that know the Island. 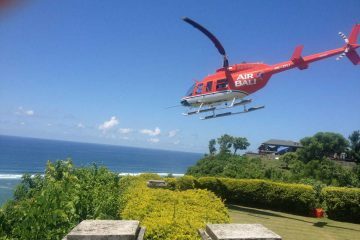 We love Bali and we hope you love your holiday here. Trust us to make it special.